Original Music & Lyrics are all in the public domain. A young, perky, ambitious but slightly naïve girl. A very pregnant, indentured singer with an amazing voice. Joan Crawford as her character from the film Torch Song. A young, handsome, multi-talented Broadway actor. The choreographer and assistant director. A young, attractive chorus boy. A powerful banker and backer of Broadway shows. A young, handsome, physical fitness entrepreneur. A chorus girl who is far from the brightest bulb on Broadway. * Can be played by a female or male actor in drag. **Should be played a male actor in drag. With the exception of Grandma and Tennie, the other roles do not have to be double cast. If desired, additional chorus members may be added. "The play draws a lot of energy from staples of the traditional drag show: parody, camp, mockery of “traditional” values, references to popular culture, and winks and nods at the audience. There is also an attitude of fringe theatre in the script -- but where many fringe shows seek to alienate older adults, I found that this script still reached out to fans of classic cinema and early Jazz music." Click the icon for full cast and character breakdown for 43rd Street. Click the icon to download free sample pages from 43rd Street.. If you have questions or would like licensing information for 43rd Street, please click the icon to contact me. 43rd Street should have the feel of a late night movie musical. Some of the locations can be actual sets, while others can merely be suggested. Click the icon for specific details. For a list of productions and/or staged readings of 43rd Street, please click the icon. Please click the icon to see logo, advertising, publicity or videos for 43rd Street. It takes balls to be a leading lady on Broadway! 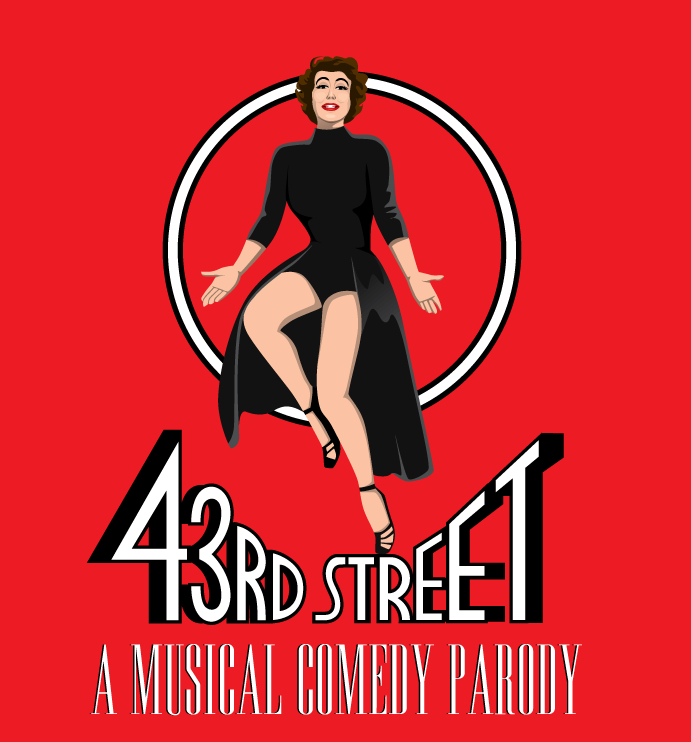 43rd Street is a musical parody that pays homage to many classic Broadway and Hollywood musicals, and pokes fun at the persona of screen legend Joan Crawford. Utilizing updated and re-worked songs from some of Tin Pan Alley’s greatest composers, it’s the ultimate backstage musical. 43rd Street draws a lot of energy from the staples of the traditional drag show: mockery of “traditional” values, camp humor, references to popular culture, and winks and nods at the audience. There is also an attitude of fringe in the script, but where many fringe shows seek to alienate older adults, it still reaches out to fans of classic cinema and early jazz music. For the person with a keen knowledge of the genre, there are over seventy five different musicals referenced in the script, and a large portion of the dialogue is composed of show-tune lyrics. For a list of the musical numbers, to hear demo samples and view sample sheet music, click the icon. 43rd Street should have the timeless feel of a late night movie musical. The scenes should shift seamlessly and merge into one another with an almost cinematic quality. Some of the locations can be actual sets, while others can merely be suggested. (With doubling, 43rd Street Requires 13 Actors). 43rd Street was a finalist in the 2017 Shawnee Playhouse Original Playwriting Competition..
43rd Street received a staged reading by Three Cat Productions in Chicago, IL. This reading was part of the 2015 Next Draft Reading Series. "I love the anachronistic references to keep the audience on their toes. I like all the work done to keep the audience in the show by referring to them constantly and I appreciate the subtle working of showtune lyrics into the character dialogues and the constant references back to Joan Crawford movies." "While the music shies away from well-known standards of the American songbook, there is a familiarity in the early jazz/ragtime music selected which makes the soundtrack quickly accessible." "The showtunes and the movies become a game for the audience to play while it’s watching the play itself." 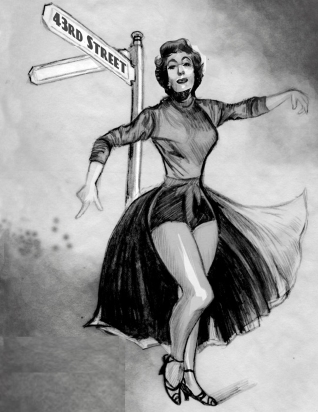 43rd Street can be performed with piano accompaniment or with an orchestra of up to ten. CLICK THE PICTURE TO SEE SAMPLE PAGES FROM THE PIANO SCORE. * Designates that a sample from the rough demo is available. 43rd Street received a staged reading by the Shawnee Playhouse in Pennsylvania in 2017 as part of their new play competition.